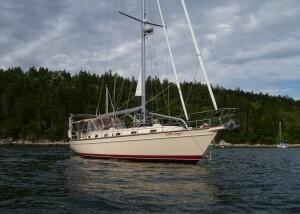 A lazy start to the day leads to an 11:30 AM departure from our anchorage at Pulpit Harbor. After all, this is the relaxation phase of our summer cruise. 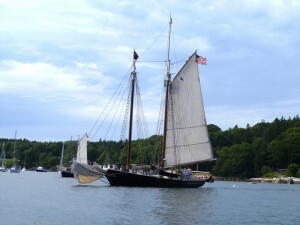 Today we sail 16 miles north to Bucks Harbor. 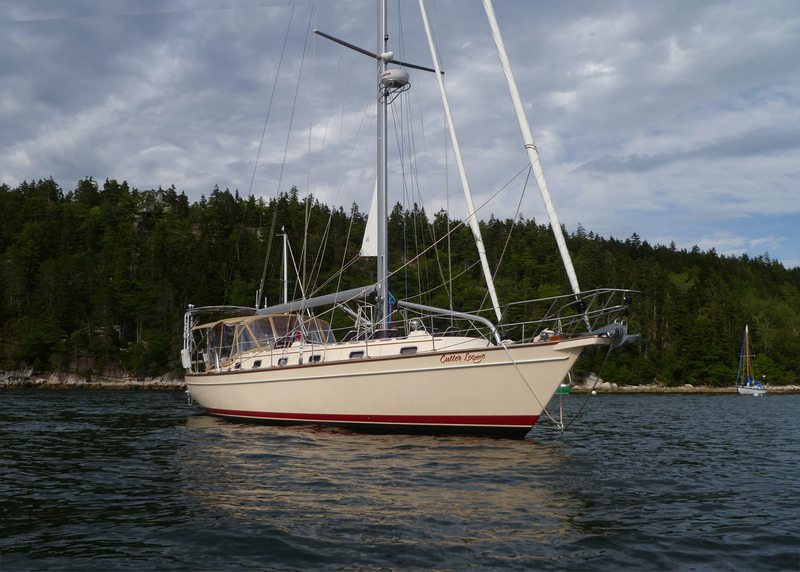 Cutter Loose is anchored just outside of the mooring field on the east side of the harbor. 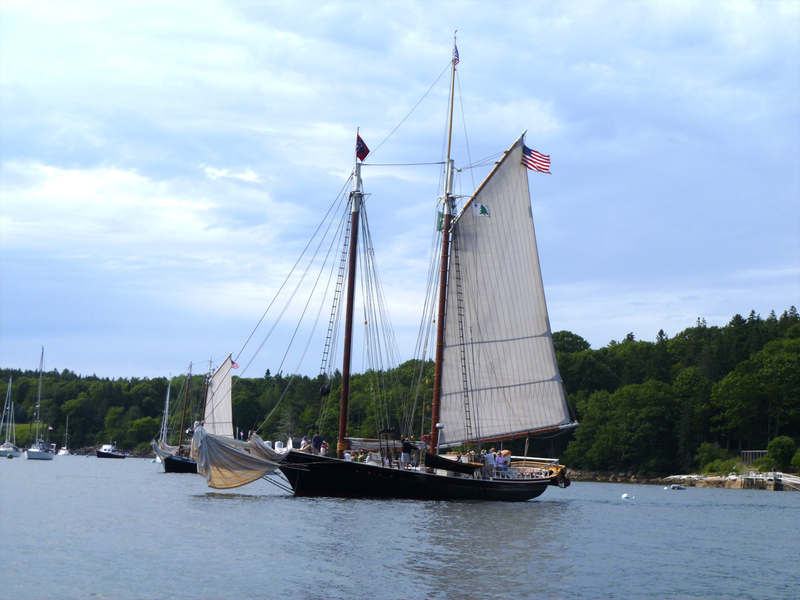 Shortly after our arrival, a procession of four Windjammer vessels silently enter the harbor sailing downwind carrying full sail. We are treated to a front row seat for this fascinating performance. Once in the harbor, each ship abruptly turns 180 degrees into the wind, dropping the bow anchor and chain in the process. The vessels decelerate upwind until the fisherman style anchor catches on the mud bottom of the harbor, jerking the ship to a sudden halt. Setting the anchor in this traditional manner plays out in 60 seconds or less. Everything is accomplished in the traditional manner on a Windjammer cruise. 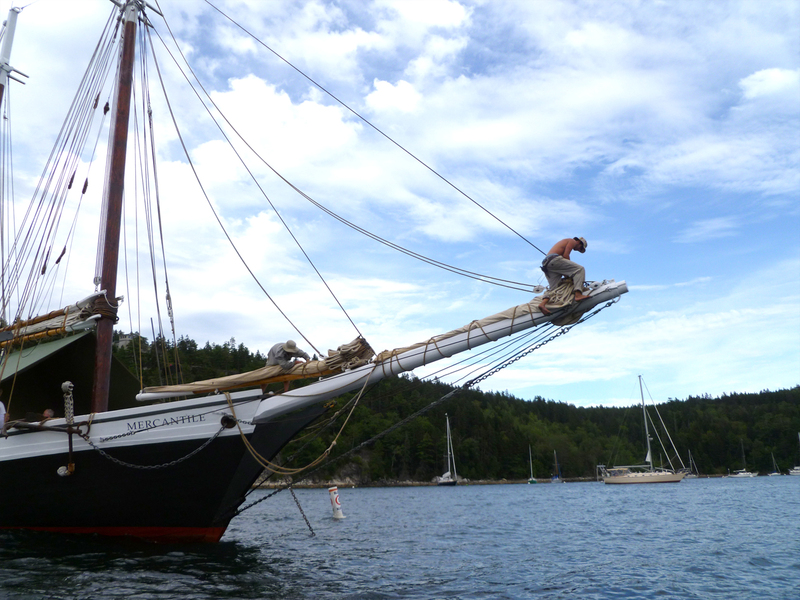 Once the anchor is set, the foredeck crew crawls out on the bowsprit to flake the headsails. At dusk, kerosene lanterns hang in the rigging, alerting other vessels to a ship at anchor. It is a delight to share this anchorage with these magnificent vessels. There is a 70% likelihood of rain tonight. 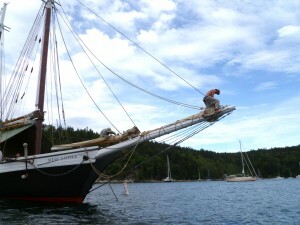 The Windjammer crews erect canvas tarps over the deck to keep the passengers dry. On Cutter Loose, we zip in the canvas enclosure to the cockpit and call it a night.